I was researching Tone Woods as i was having a custom guitar built by a dear friend and Master guitar builder and was shopping for the woods i wanted used. some how my research led me to Zager guitars. After reading the entire site I really wanted to see if all the hype was true and with the Iron clad guarantee that was offered it seemed a no brainer to at least try. besides i grew up in Nebraska and us Corn Huskers trust each other. I was playing a Michael Kelly Rose cut away that was custom setup by my luthier friend and has incredible action and tone quality. I would put this guitar up against any for playability and tone. truly a very nice instrument. I have played many guitars in all price ranges and my Kelly Rose held its own against all of them but a few. When my ZAD 80 arrived i was giddy as a child at Christmas. Absolutely Beautiful guitar. incredible workmanship and the finest playing guitar i ever had in my hands. Tones rich and full, perfect highs, Bass that you can feel. Great Volume with out over strumming and action so light i couldn't believe it. I played twice as long as I normally do with no discomfort so in comparison... there is none blows the Michael Kelly out of the water. My friends $5,000 Martin compares in tonal quality but when it comes to action and ease of play it does not compare either.... enough said? Playability and tonal quality unsurpassed. Through the internet and Ebay. It plays "as they say" real EZ. Smooth, and was blown away by the rich sound. Well, there is a lot to like. The finish and build are stunning. But I guess I would have to say the ease of playing for long periods without your fingers getting tired. Very impressive, amazing communication, this company can teach many other companies a thing or two about great customer service! Absolutely I would and would be very proud to! I stumbled into your website as I researched guitars in the $1000 range. This guitar sounds really brilliant and quality of work is top class. Of course, I have bought guitars 25 years at less than $100. The ease in playing, the beautiful finish and quality components. Absolutely. The outstanding customer service and money back guarantee. This shows that you have great confidence and take so much pride in your product. I had the guitar delivered at work and even before I received shipment, I have been talking to colleagues about the guitar. We were all excited upon receiving and had 4 guys try it out. They all admired the beauty and quality. One guy wouldn't let go and played for 2 hours. This guitar is amazing and so much easier to play. I would recommend this to a beginner or an advanced player! Its beautiful design and easy play capability. 10/10 This company sticks behind their lifetime warranty and is absolutely amazing! Yes! It is amazing in every way. 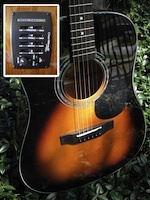 Beautiful, Easy play, electric, great sound, what more could you ask for in an acoustic? Ite is not as 'clunky' as my Ibanez classicial thin body electric, and holds a tune better. And ir is MUCH easier to play than my big Guild D-55. The CE - cutaway electric - allows me to get way up the neck, and the OM - orchestra model - is 15% smaller, making for easier playing. The built in controls are nice, but the integrated tuner really makes for easy, accurate tuning. For an instrument this precise I would pay 50% - 100% more than I did. Support is second to none. Classic underpromise and overdeliver. The free shipping got it to me 48 hours after I placed my order. Then customer support said the hardshell case was on backorder, but it arrived in a cardboard box inside a hardshell case. They had a prototype (improved) case with humidor and indicator they gave to me at no extra charge. Not to mention the extra set of strings, picks, documentation, and a signed concert picture. I would highly recommend the Zager family guitars - for this is a true family business - to anyone. I was instantly a better player because of the neck construction, custom string placement and the low, easy action. No buzzing. I compared it to my other guitars and I sounded much more professional. Did I mention this was a blem? That consisted of about 4 pinsized marks on the side near the jack. Even I cant see it unless the guitar is on its side and I am right on top of it. I am considering sending my $2200 Guild to Denny to see if he can do the Zager magic to it like he has to so many other high end guitars over the decades. 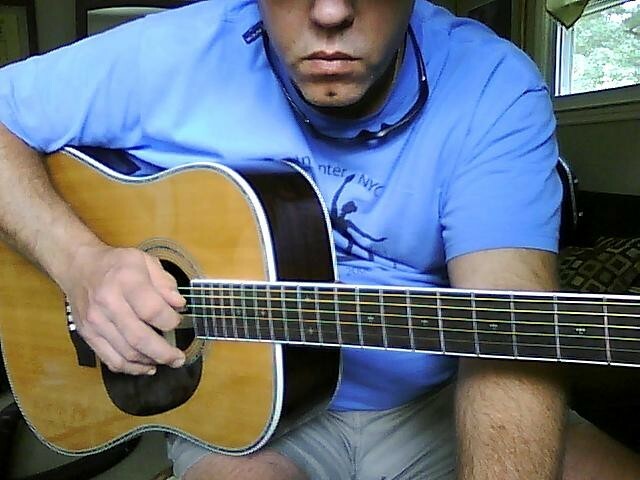 My first guitar was a Takamine Jasmine and the Zager is so much better and easier to play. The ease of playing....the string pressure is so much nicer and takes so much less pressure to play which makes this an easier guitar to play for any amount of time, especially when learning to play and need to practice a lot. Sound quality is a big plus! At least over a $1,000 which it isn't. 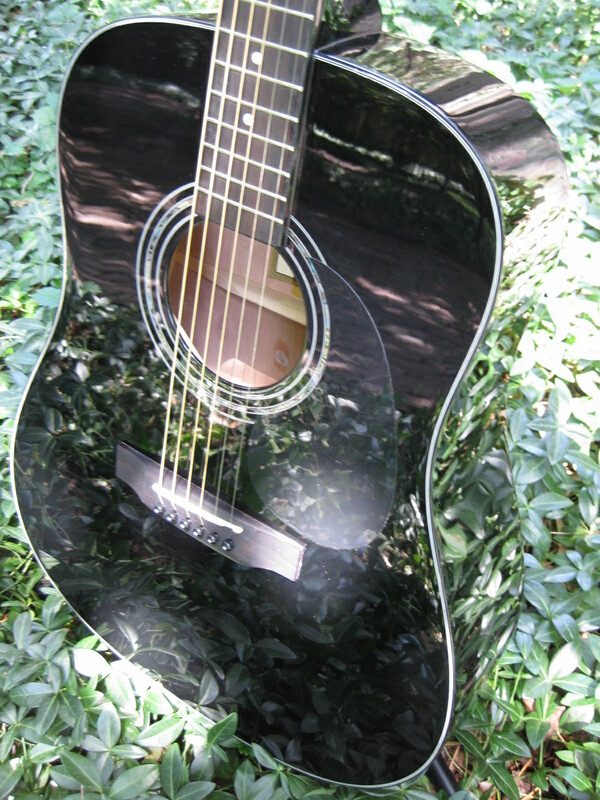 Excellent, got my guitar only a few days after ordering and the on-line support is excellent. My questions were answered promptly. Yes definitely....it is so easy to play and has such a beautiful sound quality. I have friends that play Martins and they are definitely impressed with the quality of the sound and the ease of playing it; it's hard to get them to give it back to me! I am so happy to have this wonderful guitar! I also love this size. I believe anyone buying a Zager would be extremely pleased to own one as I have been. I just found the website on the internet when researching guitars. I was suspicious at first, but am so glad I took the leap of faith and bought the guitar. I have owned many different guitars including high end models from Martin, Takamine, and Ovation. I have played Martins and others in the stores. This Zager is a very nice, wonderful sounding guitar. It is much easier to play than any other guitar (with steel strings) I have held.This guitar just feels perfect in my hands. What is my favorite part? The whole guitar is my favorite part. I just enjoy playing it. It sounds great, it looks great. It is a very sweet guitar that feels very good in my hands and sounds magical to my ears. It sounds great unplugged and it sounds great plugged in. This guitar could easily be sold for twice the price if it were sold in retail store. I would say somewhere around the $18-$1900 point would be very realistic. I have played some much more expensive guitars that do not sound or play as good as the Zager. This guitar proves a person can spend too much for a name on a guitar. Customer support at Zager Guitar should be the model for customer support in America! I have always received prompt responses to my e-mail questions, doing business was very easy and seem to have a personal touch to the transaction. It is sad that other businesses seem to have lost the ability to really go out of their way to earn someone's business. Customer service with Zager guitar could not be any better in my opinion. I was very satisfied in doing business with them. Yes I would. I have had an outstanding experience. I found this website accidentally and learned about Zager guitars. it takes a certain amount of risk to buy something as personal as a guitar over the Internet. I have had a couple of negative experiences doing this on eBay. However, this company offers a money back guarantee and even agrees to pay for shipping both ways if I didn't like the guitar. I took a chance, I bought the guitar, and I have been very impressed with my purchase. I now own a guitar that appeals to my eyes, ears and let's not forget, hands! I can play this guitar for hours on end and not be sore. Because of this, I know I will progress faster in my knowledge and ability to play the guitar because of me not wanting to put this guitar down. For anyone who reads this testimonial, I am not working for this company, nor am I being compensated. I'm just a customer who took a chance on something I read on a website and researched what other people posted for about two years before buying a Zager guitar. An acoustic guitar is a very personal instrument. It has to feel good in your hands, it has to sound good, and you should get good value for your money regardless of who makes the guitar. From my own personal experiences, it is very easy to get into the brand name game. People will debate whether a Gibson is better than a Martin or a Martin is better than a Martin and the debates rage on. There is also pressure put on players b the big companies who pay the stars to play or endorse their products. I am not here to tell you that my Zager ZAD80 Electric Acoustic is greater than a 1957 Martin D 28 or a Gibson J200. That's just something that is too subjective and not realistic. What I am going to tell you is that it is easy to get caught in brand debate. I have been there and done that with some guitars purchases I have made in the past. My new Zager guitar is a high-quality instrument that stands on its own merits. It is beautiful to look at, it rings out like a harp, the action is the best action I have ever had in a guitar. It has high quality Grover tuners and a Fishman Tuner/ Eq/Preamp. I look forward to playing it every day. My fingers are never sore after playing it. I am proud to own this guitar and it also proves something at least to me: I didn't have to break the bank to get an outstanding guitar and a very reasonable price from a company that is very good to do business with. Had I purchased this guitar first, is highly probable that I would if not purchased the other guitars and saved myself a lot of money. I love my new Zager guitar. It is a keeper and seems to be "the" guitar I was looking for! A friend brought one to Church. I really like my Zager a lot. It is compariable to the playability of my ES335. Very good. Great support and nice to work with at the point of sell. Absolutly. This guitar will allow you to play longer. It alos, and I'm not sure how it is done, but allows me to play chords I struggle with on my other guitars much easier. If you don't have a Zager... GET ONE! While searching ebay I saw Zager guitars advertised. I'm always interested when professional players are personally involved with guitar contruction. My favorite part of this guitar is the sound. It's rich, deep and sweet to the ears. I already have recommended the ZAD80ce as well as the others depending on the person I'm talking to. I would really like to encourage everyone reading this review to check out Denny Zager's online guitar instruction. I've been playing for almost 30 years but there's no substitute for learning from a professional of Denny's caliber. I have had many guitars but this one plays the best. It is very light weight but it has excellent sound. It has the best action of any guitar I have every owned. Great case too. The action makes it fun to play and the guitar is well made and features beautiful inlay. I would recommend this guitar and this company. 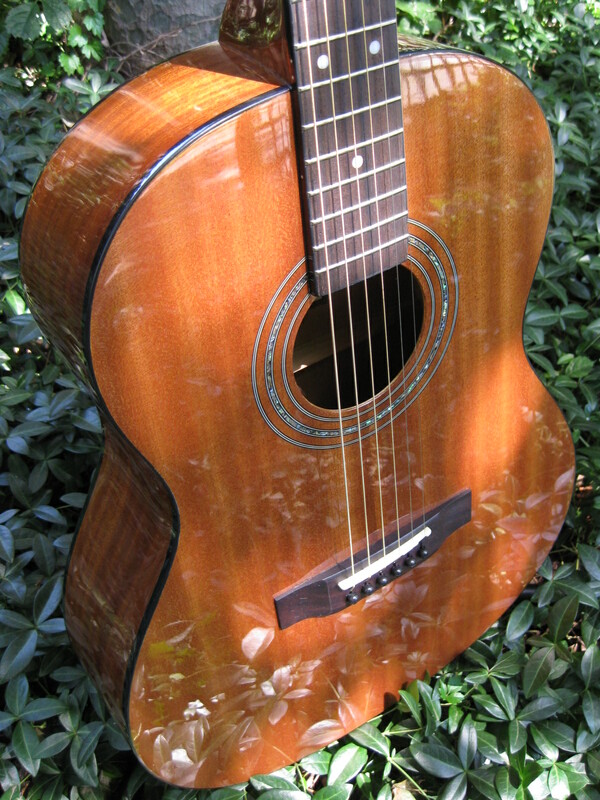 The guitar is fantastic and the service and communication from the Zager group was excellent. After 30+ years of playing I finally have what I consider a great guitar. I just need to get it away from our sons who have recently taken up guitar. Yes and have done so. I feel the personal pride , quality of workmanship, dollar value, service after sale, all are number one! I discovered it while browsing guitars on eBay. I had never heard of the brand and went to your site to check it out. My Zager is simply a pleasure to play compared to my other two acoustic guitars (a steel-string and a classical - both in the $720-1,000 price range). I am a hobbyist guitarist and my Zager has gotten me back to playing more regularly. The action on my other steel-string is so high in comparison to the Zager. I can see why I was getting so frustrated with learning new chords on that one. The low action and easy playability. My fingers aren't as sore as they used to get on my other guitars. And the tone is just sublime. In fact, the more gently you strum with the pick, the sweeter the sound. Excellent! You are very responsive to emails and your how-to videos are very helpful. Absolutely! Particularly to a beginner so they have a positive first experience with guitar. It may cost more than those mass-produced starter guitar packs that fly off the shelves, but it is so worth the investment. Zagers are beautiful instruments and obviously made with care and great attention to detail. Great bang for the buck is an understatement! I saw reference to Zager when I was looking on-line for a used Martin. I spent a considerable amount of time on their web site looking at models and testimonials. This guitar continues to impress fellow guitarist with it's rich sound and great looks. I've always wanted a Martin but couldn't afford one. Since getting the 80ce I've brought it into Guitar Centers to compare it to Martins and Martins and I honestly think it sound better than most models twice the cost of the Zager. The sound and it's design. Great...I always get support when I need it and within 24 hours of an inquiry. To be honest though, the only time I needed it was asking where they suggested putting the strap holder nob. Yes...it sounds great and cost significantly less than comparable sounding guitars. Every guitarist I've played with has asked me about it and commented how great it sounds (I'd like to think I had something to do with it). I'm not affiliated with Zager in any way. I've had this guitar 5 years and it's holding up very well. I've seen some alarming comments about deceptive marketing tactics which I can not support. Every aspect of my transaction with the Zagers has been enjoyable and on the up and up. I wish them the best success! comparible to brands 3x the price! love the volume! Also, the finish is amazing! Beautiful guitar. perfect. just doesn't get any better. super fast shipping. already have! looks and sounds amazing. Also, a joy to play. really glad to have been introduced to Zager guitars. Will order another one when i get my $hi+ together! I heard about Zager guitars when I accidently stumbled onto your website, and started to read all of the reviews. They looked nice, and well built, and upon reading the Harmony Central reviews which I put a lot of stock in, I became intrigued. Many of the players (buyers of Zager guitars) were older players such as myself (I play for my own enjoyment), and they loved them, so I had to look into it. The more I read, the more interest I had in playing one. The old vets of vintage guitars can't all be wrong about Zagers! The overall outstanding craftsmanship in which it was made. The care to detail, and it's beautiful finish and look. I had an issue with the sitka spruce (cosmetic grain of the wood), and at first did not like it. Denny Jr. was very up front with me and gave me every option with the guitar (keep and play it for awhile, send back for refund, wait for exchange, etc...). It was excellent advice as the marks have grown on me, and I look at it totally differently now. I find myself staring at it's beauty and uniqueness, and I have to put a plug in for the beautiful abalone detailing! The sound is also excellent, so that is why I can't see myself letting this one go. I'm not much of a price guy, but easily twice the cost, and that is why this guitar was such a fantastic find (and deal). I did play some Yamahas that were easy to play and did sound good (twice the cost) , as were some of the lower end Martins, but the ZAD50CE is right there with them in my humble estimation. Excellent would be the rating, as I have had nothing but positive transactions with Denny and whoever is emailing back. The before mentioned issue was so well handled by Denny as he totally understood where I was coming from. He gave me every option to handle it, whereas another company wouldn't go there in most cases. I am a proud owner of a guitar that is extremely well built, in which the manufacturer stands 100 percent behind, and will be more than willing to help out if there is a problem. What more do I want? Very much so. For the very reasons mentioned and answered before this question. Outstanding craftsmanship (hard to find nowadays! ), high end quality, excellent customer support, and excellent sound. All good reasons to do business with you! Thanks for being so affordable, and great to do business with, and for the great product. My only wish is to put gold Grover's on because I love gold with the light browns of the African Mahoghany, and the saddle issue which may need to be resolved? I measured the height of the strings at the 12th fret and it is 3/16" and almost 4/16" (1/4") at the last fret? It plays well, and sounds great.....so? I also feel as many others did, that the case is great. It is a nice case for the money, and looks great, not to mention the humidity reader! Thanks again for everything. I have been playing guitar for over 40 years and this guitar has the best action of any acoustic guitar I have EVER played. It is also very light and while I think it is too nice to play "out", you could play it all night without tiring. Absolutely...for all the reason listed above and with the money back guarantee, you can't go wrong. This guitar is beautiful and very nicely finished...surprisingly lightweight with a nice warm tone and stinging treble bite. 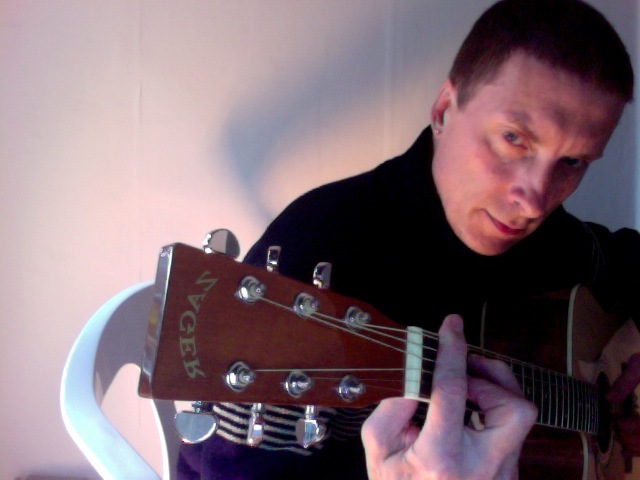 It has been great for the music that I play which is acoustic blues, rock and folk rock. Zager is a great company to do business with! This ZAD-80-CE sits at the top of any guitar I have ever owned in the last fifty years. Every part of this guitar is my favorite. This guitar is more than I would expect from any $2000.00 guitar out there. Customer support? Dennis is the absolute definition of customer support from 1 to 10 a 20 wouldn't be high enough!!! I already have recommended zager Guitars to others. All they have to do is hold and play this guitar,then they know why..
Best one I have ever had. It is superior in sound and playability. The rich melody that it produces. Yes, it is a wonderful instrument at a very affordable price. I come from a family full of musicians, and this guitar is the finest I have ever played. It produces better sounds than the Martins and Gibsons my cousins own, and came at a much better price. I was searching e-bay for a upper end Martin acoustic guitar and came across an ad that was selling a guitar that was set up using a e-z play system. 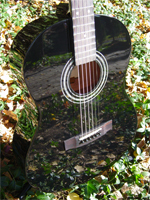 Doing more searching on e-z play systems I found Zager Guitar web site. As I read what others had to say about your guitars and how they were blown away by the quality, sound, and easiness to play plus the cost savings comparied to other high quality instruments, I wanted to know more. Your web sight provided the details I was looking for. End of search! When I open the packing box and showed my new ZAD80CE to my wife she was impressed. She doesn't have an ear for music, but enjoys my playing. She could tell that the sound was richer that my other two guitars. My first is a Washburn D46S and my second a Seagull SWS CW CE. To me there is no comparison. 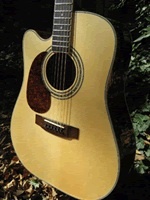 The ZAD80CE play easier, sounds richer, earier to tune and stays in tune. And the craftsmenship is equal to or better than the higher end Martin's I played at different guitar stores. I really cann't name just one favorite part. The look, the sound, the feel, the construction, the quality, and the easiness to play. This instrument as a whole is just beyond my expectation. The details you encomposed in manufacturing a high end quality insturment is more than what I had been looking or afford to own. Period! While I was searching and playing other high end guitar, fifteen hundred to three thousand dollar price range, I had focused in on Martin's, because of the quality, the richness of sound, and listening to others who own and play them. Martin's have been around a long time. I like quality, and I know when I play a quality instrument. I put my ZAD80CE in this same class without a doubt. I know own and play a high quality instrument. Ordering and shipping was great. Your staff answered my questions and concerns in a timely and professional manor. Absolutely! I'll be taking my guitar to church in a couple of weeks for an open music session and see what the other guitar player have to say when they play and compare the ZAD80CE to their guitars. (Martin's and Gibson's) And if these players comments are anything like the other comments posted on your review sight I need not say anything more. I am enjoying your e-z play lesson system. I had not finger picked before, but always wanted to, so this is new to me and I am enjoying the lessons very much. Don't stop doing what is right. Thank You! Unquestionably easier to play and a very clear sound. I bought the Zager Parlor because of the size (I have a small body frame) and I do like the way it "fits" me, though I did sacrifice the deeper, broader tone of the bigger guitar. As my skills develop, I may be able to handle a bigger one -- and I'll have a lucky grandchild who can inherit the Parlor. Only time (and practice) will tell. I don't have enough experience to answer this questions, but friends and family members say it looks and sounds like a much more expensive guitar than it is. Customer support is unmatched! Though Zappo shoes is a close rival :-). Satisfaction guaranteed is about as good as it gets. And the on-line conversations have been great, with almost instant and personal responses. I have already, for the easy play feature, the beautiful appearance, and the personal and generous customer service. Thank you, for the guitar, your interest and personal touch, the strings, the tee shirt, and probably more thank yous when my guitar skills improve because of my Parlor Zager. 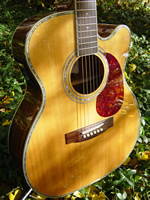 I was cruising through E-Bay looking at acoustic guitars and found a Martin with Zager EZ play. 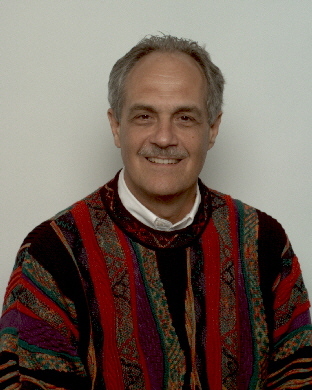 I looked Zager up, found the web site, and liked what i saw. If my old guitar was a Model T, the Zager is a star ship. It is very easy to hold the strings down. The sound is great. The guitar is very light to hold. I like all of it, it is a complete package. The price of this guitar should be $1500 to $2500. We have not tried it yet. yes, ease of play, price. Found it on the Zager web site. Every guitar has its own best use. I currently also own a Guild and a Martin 12-string, and both of these are the best in my household at what I bought them for. I became interested in the Parlor because it occurred to me that it would also be nice to have a smaller guitar with easier action. I have played a lot of guitars and have to admit that even among that fairly large number, the Zager is the easiest of them all to play. This is the best set up I've run across, and it is especially well suited for finger style guitar players. I think it is fairly priced as it is marked on the site. However: the guitar I bought was deeply discounted because it had a couple of surface scratches. When I received it, I had to look hard to even see them and I think this one was a real bargain. It is an attractive little guitar. It's also clear to me that the instruments are examined pretty carefully before they are sold. My recommendation to people: definitely consider the discounted guitars, as there are some good buys in this group. But the regular price is a fair one, too. Outstanding. It's been a long time since I've enjoyed this level of customer service. Yes. This guitar is ideal for beginners, for more experienced players who want to learn new music without working too hard, and for returning guitar players who may not have the agility or strength in their hands that they used to. For everyone else, it is just entertaining. It definitely extends the time that you can comfortably play. Sometimes, you just want to relax and play music without taking yourself too seriously. This is a nice little guitar that is a pleasure to play. It is exactly as represented and I think most people would enjoy owning one of these. I was checking out Ebay and saw a guitar that was "Zagerized". I consequently went to the Zager web site to get more information about what that meant. I liked what I read and saw and now i have a Zager guitar. There is no comparison to my old Spanish model. It is so hard to play that I constantly have sore fingers. I did go to the Guitar Center and tried some very expensive Martins ($1720 to $2200), but the Zager does play easier, has a cedar top, and is a much better value. I love the way it looks for one. Just beautiful! Also I don't have to press so hard on the strings and the sound lingers and lingers. Outstanding! My questions were answered promptly and they provided solutions to my inquiries. Yes I would. The craftsmanship,attention to detail, sound, ease of play, and value. Guitar arrived a day ahead of schedule. Great service! I tried a Martin Limited Edition that a girl in my band has before I bought the Zager Zad80ce and have played the Martin after getting my Zager. My Zager plays easier , has a better electronics package with built in tuner and a wide range of tones with the built-in equalizer . The girl who owns the Martin Fall Edition says she would have liked to played the Zager before paying over $3000 for the Martin . She loves the Zager's looks, sound , ease on the fingers and especially the price . It's every bit as good if not better than the Martin Fall Edition a girl in our band bought at over $3000 cash ! I already have by just letting people play it and the guitar does the rest. After my buddies play it , they aren't real quick to give it back. One of my band buddies bought a Gibson J 45 Custom and has been playing only it for the last 2 years, well last Friday night. when my Zager was making the circle of my friends trying it out , he finally got his chance to play mine and after a song or two he told everyone else to play his Gibson and he played my Zager the rest of the night. Afterwards he told me his fingers had never felt as comfortable after playing straight for 2 hours at a time. He is sold on it and he asked me to loan it to him for this Friday and Sat. night when I wasn't playing it. While doing a search on eBay for a Seagull S6, I came across an auction for an S6 that had been customized by Denny Zager. I read the information and loved what was described. So, I thought, "Well, heck, let me look up Denny Zager online and find out more about him and if he sells his own guitars?" The rest is history. Unfortunately, or fortunately actually, I didn't do much more research than the internet and reading reviews. "Unfortunately" because I have nothing with which to compare my Zager. This is my first guitar. I say "fortunately" because I am kind of an impulsive buyer and had I gone to a store and tried out a different guitar, I might now be writing a review on the Seagull S6 and not my Zager ZAD20CE-LH. So I am thankful that I came across that ebay auction and God led me to zagerguitar.com. Oh, gee, it is just beautiful to look at. I brought it to my father's house to show him and he was wow'd! It is a piece of art. I love the way it feels in my hands. The balance is perfect. The sound is extraordinary. Finger work is easy. I don't feel any cramping after practicing. Its just an amazing bit of craftsmanship. Well, I was pricing out acoustic electric guitars and think this guitar is a steal! I would think that the Zager name alone would jack up the price, as some company's ride on celebrity more than quality. With that thinking, along with the craftsmanship, I'd say this guitar wold cost at least double in a specialty shop. Oh, now here is where this review gets good. Customer support is not of this earth!!! The very first email I sent, I got a reply within minutes. I had a bunch of questions being a newbie to guitars and each and every question was answered promptly and courteously. Never, ever did I get a response that even hinted at impatience. Even after I had finally settled on a model only and realized that, "Uhm, do you have a left-handed style?" Dennis and Jill were very friendly and helpful. It truly made the experience of buying a first guitar, site unseen, untried, most memorable and enjoyable. I would recommend this guitar to others, absolutely! As I said, it is truly a great piece of work. I've been playing it everyday since I got it and my fingers tips are tender but my fingers aren't cramped. I like to draw, so that was a concern for me, but there has been no pain to prevent me from drawing afterwards. Though, I don't have much knowledge or experience with acoustic guitars, I am glad that I was blessed with the best choice I could've made in selecting a Zager over anything else. I know that that's what's going to make my passion for learning guitar a more enjoyable experience. Thank you. Orignially, I was searching internet with words for "easiest acoustic guitar to play"
Fuller sound, beautiful inlay and color and ease of chording. It is hard to pick one specific thing, but I suppose I still have to say ease of playing is still right at the top. I have to say ease on the wallet is also a top choice....with the price, I was able to get the guitar, case, additional strings, T shirts, capo and a year of the student Library for much less than what my friend paid for his least expensive guitar. $1600-$2400........basing this on comparison with what friends paid for their instruments. Just thanks to Denny, Dennis and Jill for their service and support. Comparable to the best I have played in a combination of fidelity and ease of play. My old guitar is a Guild acoustic/electric and doesn't have near the playability or sound of my Zager. My favorite part is the neck/fretboard. Excellent action and crafted for ease of play. Excellent customer support. All questions have been promptly and accurately answered. Absolutely! In fact I have already "spread the word" by encouraging my guitar playing friend to check out the web site. I will only recommend a product I believe in and trust. I have played for quite a few years and actually put down my guitar for most of the past 10 years. I work in a high stress enviromnet and considered that picking up the guitar and playing again could provide some needed relaxation. I was not satisfied with the sound and action of my old guitar and began researching the internet for alternatives that wouldn't break the bank. The result was my purchase of a ZAD-80CE which has everything I was looking for in a guitar with the added bonus of excellent craftsmanship at a reasonable price. I am a proud owner and am enjoying playing as never before. It beats my Yamaha hands down for ease of playing and sound quality. Customer support is unparalleled. Several years after I bought the guitar the nut broke when a home repairman knocked the guitar off its stand. Zager told me how to remove it and send it in to them. They custom made a new one for free and had it back to me in a matter of days. You can't get better customer support period. Absolutely! A great guitar at a fair price, and the best customer service around. Once you buy a guitar from them you are part of their family and they will take care of you. This is a toss up. Playability, or sound. They are clear, bright and the sustain is second to none. Excellent, I have sent emails that were responded to within minutes. Without a doubt, Save yourself a lot of pain, both in the wallet and with your fingers! My Zad20CE is destined to be the road guitar, as I travel a lot and enjoy taking a guitar with me. They are both beautiful guitars. When I took a 20CE to a shop to show a friend, everyone there wanted a little time on it. I wouldn't recommend anything else for any level of player. i was surfing the net a few years ago and ran across some references to Denny Zager E-Z play guitars, and then i checked them out on Harmony Central and liked what they said and i wanted one ever since! but it took me a few years to be able to buy one. i have some excellent, great-sounding guitars, but no expensive big name ones except maybe my older McPherson, which i bought at a bargain price on ebay, but my Zager 80ce-om has a fuller, sweeter deeper sound and it does it much easier than the others. it has a fuller resonance than my other guitars even tho it's a somewhat smaller orchestra model. it's a beautiful, friendly-sized guitar with a big guitar sound! the sweet, mellow tone is absolutely fantastic! and it projects its full deep round sound so easily! the tones are complete and clear and so easy to achieve that my 80ce-om makes me want to pick it up and pick it! the woods are top grade tone woods, put together and trimmed to perfection! it plays so beautifully unplugged that plugging it in and taking advantage of the great Fishman electronics is almost an afterthought! 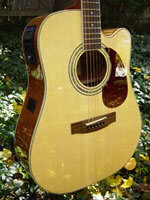 a great guitar should be great plugged or unplugged, and my Zager 80ce-om is great all around All-American guitar!! i would guess at least $2,000-$3,000. i've played big name, big reputation, big buck guitars in stores and i wouldn't trade my Zager 80ce-om for any of them even money! if the price were based on sound and playability my Zager would cost many times what i payed for it new from Denny Zager! so far, with the contact i've had with Zager & co. i would rate them at the top of my guitar-buying experience! they answer emails promptly and friendly and with caring understanding and reasonable accomodation. i don't anticipate having any guitar issues to bother them with, given the high-quality of their guitars, but if i did i know they'd help me out to the max! 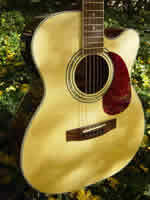 i absolutely reccomend Zager E-Z play guitars to every player i know, and especially my 80ce-om! it's the perfect sounding, perfect playing, perfect sized and best looking guitar around! and for the direct-buy price from from Zager it's a world-beater!! This is the only accoustic I have ever played that did not kill my fingers after a few minutes. It came in around 1PM today and I played it for 3 hours. Then I called one of my buddies over tonight and we played it for another 2 hours and my fingers are still good for more.. I normally play a Gretsch Country Classic that frets like a dream so my fingers are not real tough, and after several hours on the Zager my fingers are still good. Great Guitar and the other folks In the Band will get a chance to try it out in 2 days. Get ready for more orders from some of them. I picked on a new Martin one of the girls bought 2 weeks ago for about 10 mins. and my fingers started barking so this girl id in for a surprise when she plays my Zager. I alredy have and will continue to . I love this Guitar and especially its ease on my fingers and still with that great sound and finish. The folks in my Band will be ordering Zagers after they get a chance to play it. Doing research on line I came across the brand and was interested because of the other reviews. I have owned and played both Yamaha and Martin guitars and, while I truly love the sound I get from each - they are very different - the Zager really is an easier guitar to play. 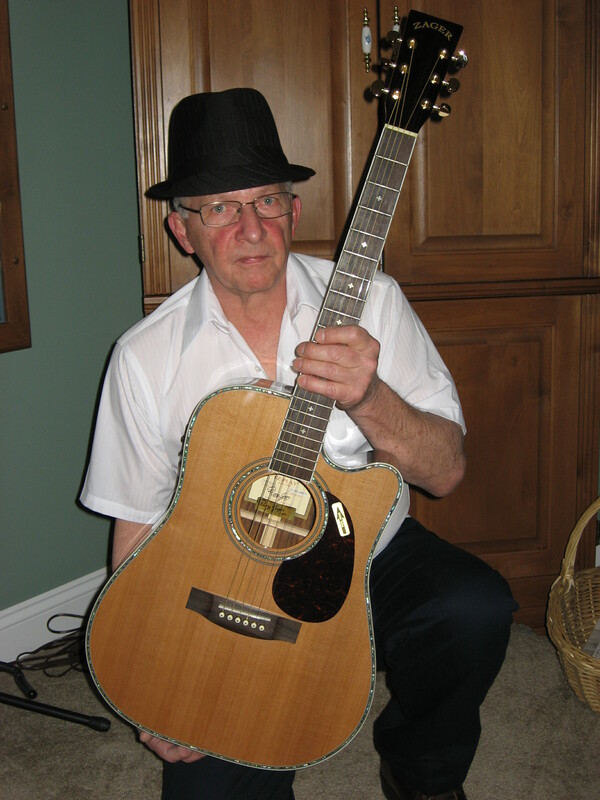 The sound is good - comparable to my Martin but the Zager tune allows me to play much longer. I also find that this guitar looks great. I like the way it looks and sounds. This is where the company shines in my estimation. I bought a guitar and was told there were blemishes - and I got a discount. When I received it I loved the way it sounded but the blemish bothered me. My wife teased me because it clearly didn't effect the sound at all, just my sense of perfection. I emailed the company and, within a day, they had sent a replacement - which is perfect. I did pay a slight difference in price - which I should have paid in the beginning - but the company picked up shipping and even sent me a second T Shirt. Truly they went above and beyond in every aspect of the customer experience. I'm one of those people that drives the music store crazy. I look and play and look and play before I buy. In my experience this guitar meets the high expectations the web site builds - it sounds better and plays much, much better than the price would indicate. It is beautiful too! Customer service is king these days and Zager exceeded all of my expectations in resolving a problem of my own making - Thanks! E-Bay browsing in 2006 and then followed up to the Zager website. 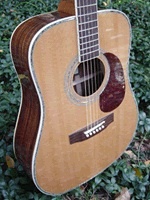 I have a friend with a $4000 Martin bought about 10 years ago that doesn't look as good as my ZAD80CE. 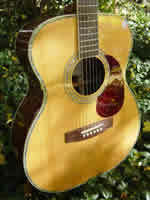 I like the sound of my ZAD80CE (bought in 2006) just as much as his Martin and the ZAD was only one fourth the price. I can't tell any difference in sound except that the Martin plays a little louder with the thicker strings my friend uses on it. I can not justify $3000 more for a guitar that sounds the same. And, the Martin has the much sought after Brazilian Rosewood back and sides. Again, the playability of the ZAD is superior and I can't tell any difference in tone. That makes the ZAGER a better deal in my book. Ease of playing, the sound, the fit and finish in that order. I can't say enough good things about Zager service. Doing business with ZAGER GUITARS is a pleasure. Outstanding fast support and courtesy is what you get with ZAGER. They have shown me repeatedly that they honor the 100% return policy that is stated in the website. True story - The first guitar I received in 2006 had a slight flaw on the finish that I believe happened in shipping. I contacted Dennis Jr and he immediately responded without question providing me with a return prepaid shipping label and said to keep the extra goodies that came with the guitar (shirt, strings, pictures, picks, etc). He immediately sent a replacement guitar that I have to say is truly beautiful. The grain direction, the finish, the setup are all perfect! I love this guitar! And another set of goodies came with it! I play a lot in my shop which is quite a bit colder than my house. I did not want to keep exposing the ZAD80CE (a full size) to the temperature fluctuations going in and out of the house so I decided that I wanted a second guitar to just keep in the house. I ordered a second, smaller guitar from Zager, a Parlor Mahogony. When it arrived (in just 5 days from Nebraska to Seattle) I found that I did not like the shortened neck that is standard on the Parlor/Travel series. I contacted Dennis Jr and once again, he immediately responded without question providing me with a return prepaid shipping label and again said to keep the extra goodies that came with it. I asked Dennis to replace the Parlor with a ZAD80CEOM Orchestra Model. Dennis sent the more expensive replacement out before I even posted the Parlor back to him. The OM is on it's way to me now and the Parlor is just going to UPS today! Really, that's good service. No questions asked. Just answers. Well done ZAGER GUITARS! Already have recommended it, repeatedly. It is the best value that I have found for a guitar. One guy I recommended to bought a ZAD20CE based on the recommendation. 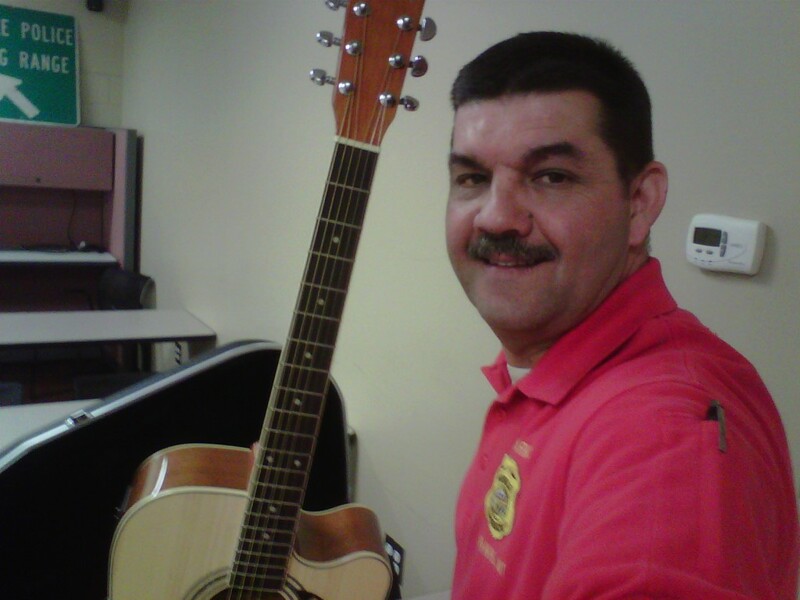 He has many guitars and the ZAGER is one of his favorites because of the playability. The "string science" setup is the frosting on top of the cake and finishes making my ZAD80CE the superb instument that it is. Playability of this guitar can not be surpassed without an experienced luthier doing a lot of work. That PROFESSIONAL setup is standard and comes included with the ZAGER. A BIG sincere THANKS to ZAGER for their honesty, speedy service, and for such a fine product at a very fair price! I own a 1972 martin d-41, and it is in really bad shape from age, the glue is coming loose on the neck, and cracks in the finish... My ZAD 20 has taken its place, as well as the others I own.. I dont want to play anything else..What a great sounding,easy playing guitar. two parts.. Number 1 is the easy play feature.. Its everything you advertised,and more, Number 2 is the on board tuner, and audio adjustment. I was looking around on the internet, wanting to buy a new guitar. 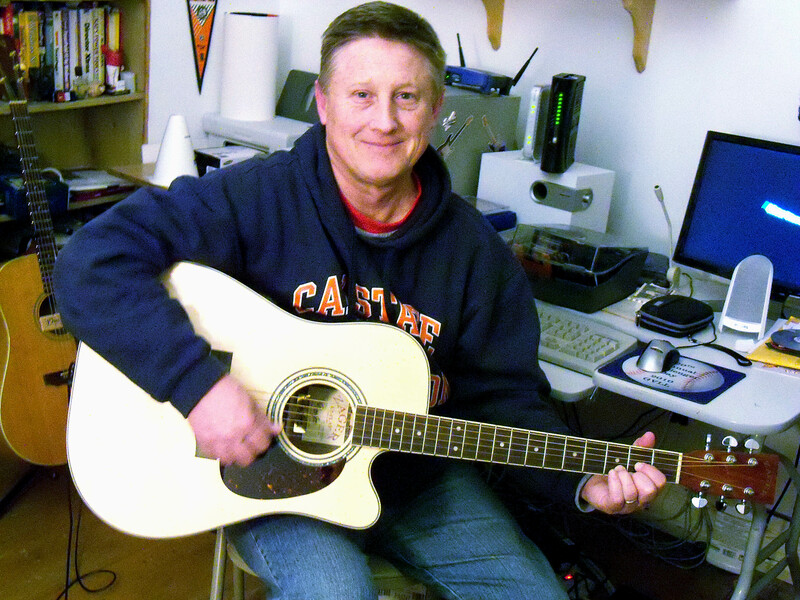 I ran across your Zager name, and read about your guitar, your warranty,pricing, and models. It is easier to play, and sounds great. I have a guitar that I bought many years ago, which doesn't play as easy. The playability, fit and finish is excelant, and it's pretty too. I would guess about 995.00. I was looking at Martins on the internet, and their low end was under 2000.00. Good, so far I haven't needed much. Yes and I have already done that several times. I gave your web to several people, but I don't know if it has helped you. Everone that has seen my guitar likes the look of ir. 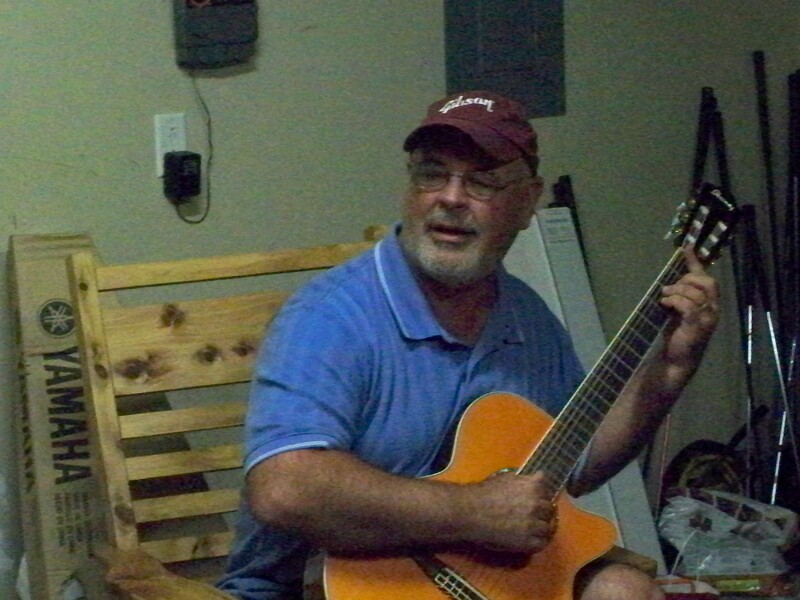 I play with a group at Veterans Home, nursing home, and our Jackson Senior center about 6 times per month. I Googled "easy play guitar" and the Zager web site was first on the list. My other guitar is a Fender 12 string I purchased in the mid 1980's and is a fine guitar but when I developed arthuritis in my left thumb I could only play it a little and then not at all. The other acoustic guitars I tried in the shops didn't have the neck I was looking for so I went on line and came accross the Zager guitars. I had nothing to loose so I ordered one. When I took it from the box and tuned it it took a few minuites and I was playing again. The neck reminded me of my Old Fender Mustang from the 60's with a good fast action. The Zager has the neck I was looking for. I recomend this guitar because it is everything that it was said to be and more. I told a friend about it and he bought one too. The Zager family needs to cary on the tradition and don't pay attention to what the critics say. They must not have been there. Like night and day, compared to my previous guitar. The tone and playability are equal or superior to almost any I have tried in stores. This is a great guitar at any price point! Playability would have to be the most endearing feature. Although, the sound and great looks are top notch. I have, and others have purchased as well. The way Zagers do business, it's a no-lose proposition. I may never need another guitar, but if I do, it will most assuredly be from Zager Guitar. I found it on the E. net, and I bought one the zag 20ce ,about 3 yrs ago and i love it. I have 5 other guitar,s But the zager 20ce is the only one I play because of the ease of playing. I have , a washbon,and several other brands. But the best one I have is my zager,and I love it Keep up the good work.I have tried to play, over 40 yrs, but allwayes would give up because, my fingers would get so sore But with the zager, it lets me play, without my fingers geting sore and I like the sound and tha looks as well. It is the best Guitar, I have ever owned, and I have 5 other Guitar, But it is the only one I play. It must be very Good, but I have not had to use it,I have had no problems with my Guitar. I am very plesed with it. I have Suggested it to other people, To check out the web sight. I am getting ready to order, The Zag 20 Black , I like the looks of it, I just wished I could. get it with the electronis, like cut out has. Came across it on E-bay and clicked on the link to the site. I own a 30 year old Japanese Dixon, and have owned a vintage Kay. Also have tried out many guitars of every brand in my search to get the right guitar. I was looking at top of the line Martins, ovations, Gibson, etc. New and vintage models and the prices ranged from 2,400 to several thousand dollars. I can honestly say that there was not a single guitar I tried that played any easier or sounded better than my Zager. Parts. I cannot pick just one, its playability is first, second is the sound, and on top of it all it is absolutly beautiful. It also helps that everyone that sees and plays it turns green with envy. Unbelievable. 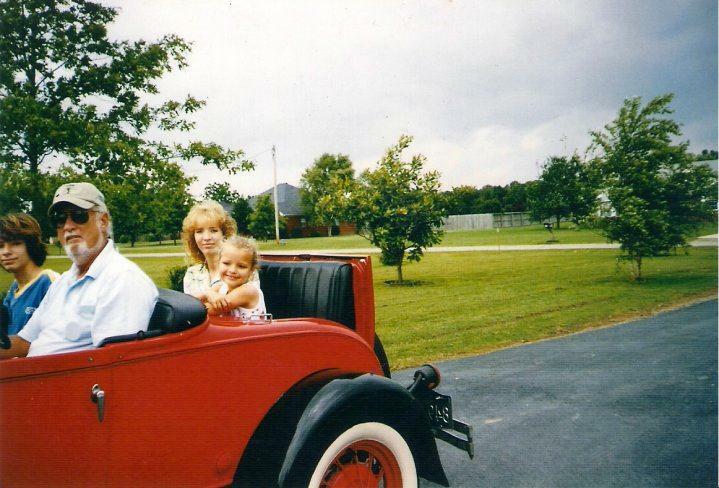 I have never dealt with any company who not only is as customer minded but is as personally involved as Zager guitars. I could not be happier and tell everyone about the care, and attention that was paid to my questions and purchase. Not only before the sale but after. Absolutly!!! 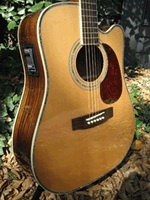 There is not a better guitar for the money anywhere and the customer relations are fabulous. I spend time everyday playing my guitar. 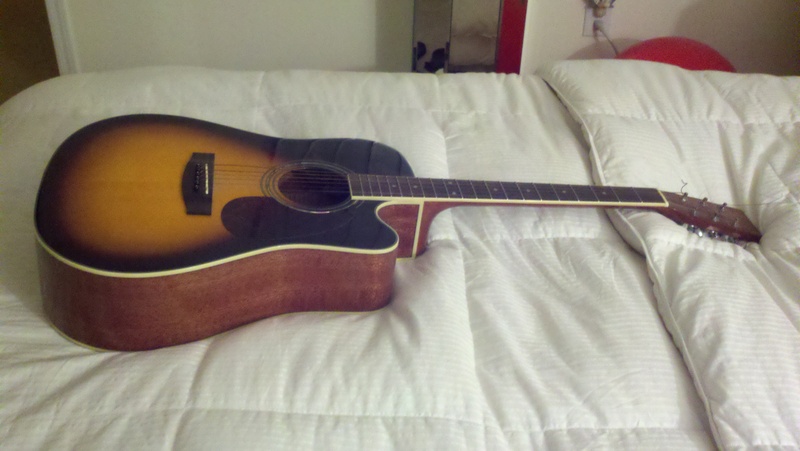 Not only is it very relaxing but it sounds amazing and I can play for hours without it hurting my hands. I feel like the luckiest guy in the world for having found the link to Denny's site and making one of his guitar's mine. I had never seen or played one of his guitars, and am a firm believer in the old addage if it sounds to good to be true it probably is, but there were so many great reviews of his guitars I took the chance and boy am I glad I did. I am saving now to get the ZAD 900CE and I can hardly wait! Absolutely, top quality construction, hardware and sound quality at a ridiculous low price. I hope to add to my collection in the future with more Zager guitars. Thanks So Much. Well i have looking for a guitar for a while but not just one like in stores that i have seen just didnt please me because of the not passion like the Zager and fam. has put into this fine piece of work and passion into it has a lot to do with it and you can feel it hear it. Ha no compare and iam glad this one is mine. Not sure about that.But i no i got more than i though. Ha i got more. Yea and when i show this guitar to them and they will no. Thank yall i now i will enjoy this for a long time. First saw it on EBay as i was looking for used Martin's. Nothing I have ever had, compares to this guitar. First the sound of this guitar is beyond excellant. Next the finish is perfect!!!!!!!!!!!!!!!! You would need to be in the 3K plus rage to duplicate this guitar. I already have. When the product and experiance exceed my expectations I always share. I played this guitar for 4 hours the first day and my fingers don't even know it! THANK YOU! The action! Barre chords are easy now! Pity Zager don't ship overseas. Plenty of people would understand there's an extra cost and be willing to pay it, I'm sure. From afriend then studied it on the web. I've owened Fenders strats,Epiphone,Johnson,higher end Ibanez,Paul Reed Smith,Ive played Martin, Gibson. I only own one guitar i enjoy playing as much,thats my Martin. I like the finish,the sound,and the playabilty. This guitar is comparable to my buddies old Martin. So 800 to 1100. So far its been Great. Yes i would its a great guitar for the price, and would stop alot of fustration for biggener players. 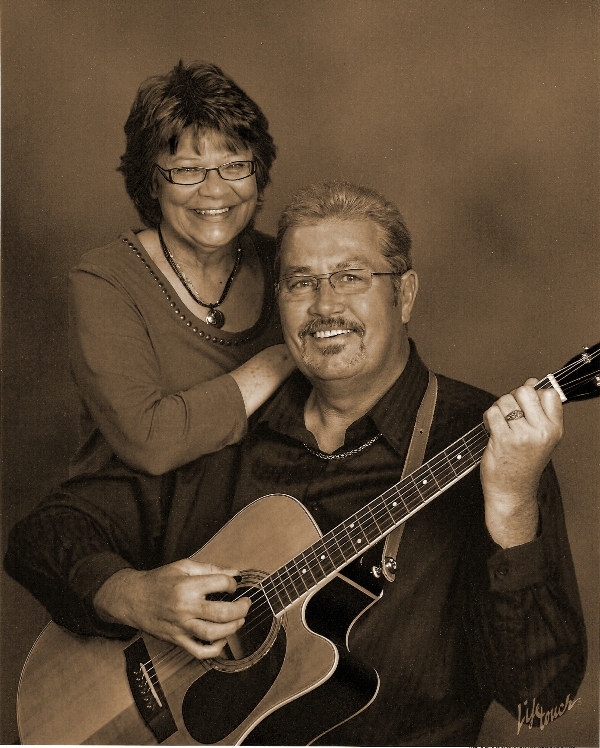 I want to thank the Zagers for a great guitar and great service. Its good to see a small familey business still "Doing it in America". I have an Ovation that I have had for over 30 years, a Martin that I have had for over 45 years, and a 3/4 size guitar from Fender. I just bought a Zager trevel model, that is the exact same size as the small fender. I have been looking for another small guitar to travel with and at the same time did not want to sacrifice tone quality. I liked the small Fender, but it lacked a lot in tone quality and finish. To my surprise, the travel Zager guitar beat the tone, finsh and string spacing on the Fender and Ovation. Trying to compare with the old Martin is not a good comparison as it it was made in 1913 and has a number of major cracks in it. I have owned a slew of various guitars over the years including Washburn, Gibson, and other Fender models. I have to say this little travel Zager is going to be a keeper. From just the finish it would certainly appear to be a guitar that would be a lot more than the current price...by at least several hundred dollars. Jill was quick to answer all the questins I had and keep me up to date on shipping etc...first class. This guitar is a work of art! 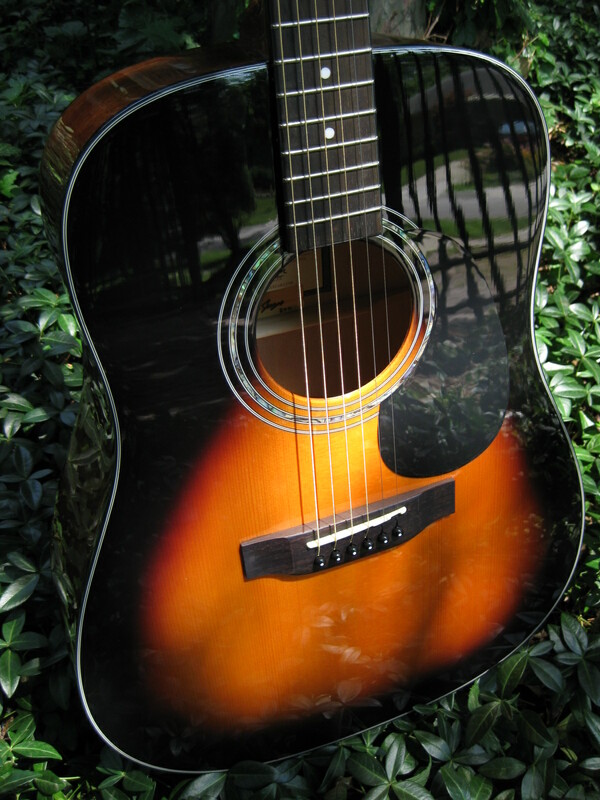 I have never picked up a guitar that has the incredible clear, deep sound as my ZAD20CE. The sound, the beauty, built in tuner, and especially the easy action. I have never been able to bar chords, until I got this Zager! Much higher than I paid for it. $1500 to $3000. Exceptional. I have never worked with any company that is as people friendly and eager to answer your questions as Zager. It doesn't even feel like a company, but more like family. Oh, yes. I teach a guitar class and I am sure when my students see, hear, and play this guitar there will be more orders coming your way. I cannot image what would happen if other companies ran the way Zager does. We wouldn't be in the economic crisis that we are. You should send you business structure to the White House! Thank you Denny for a fantastic guitar. It is literally a work of art. And thank you Dennis for you incredible time and patience with my questions. I will continue to be in contact; probably take some lessons; and definitely be singing praises for you, your guitar,and company.